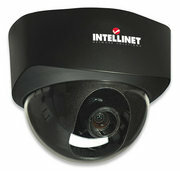 The Intellinet Pro Series Network Camera, Model 550796, is designed for security surveillance applications, and comes fully equipped with state of the art features setting it apart from other network cameras on the market today. 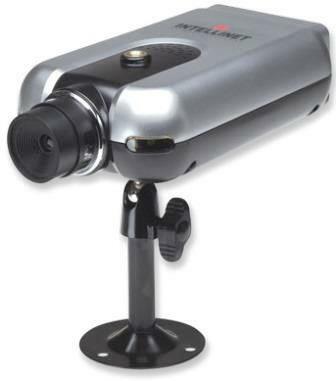 The Intellinet Pro Series Night Vision Network Camera, Model 550291, is designed for daytime and night-time security surveillance applications, and comes fully equipped with state-of-the-art features, setting it apart from other network cameras on the market today. Because the Pro-Series Network Camera uses a CCD sensor, it provides sharp video images with dramatic lifelike colour representation. The Intellinet Pro Series Network Dome Camera is designed for security surveillance applications and comes fully equipped with state-of-the-art features that set it apart from other network cameras on the market today. Not only is the housing small and discreet, it can also take a beating. Thanks to heavy-duty aluminium and the use of tamper-proof screws, the Network Dome Camera is well-protected. 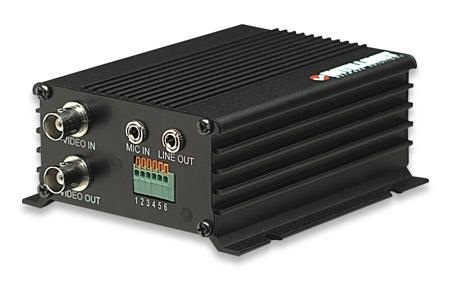 The INTELLINET NETWORK SOLUTIONS NFC31-IR Megapixel Night-Vision Network Camera is designed for security surveillance applications, and comes fully equipped with state-of-the-art features that set it apart from other network cameras on the market today. 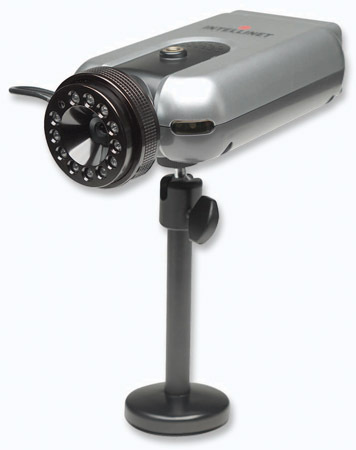 The NFC31-IR Network Camera is equipped with a 1.3 megapixel image sensor that generates crystal-clear images in resolutions of up to 1280 x 1024 pixels, providing a much more detailed video. Thanks to the use of progressive-scan technology, jagged lines caused by regular interlacing image sensors (flickering effect on moving objects) have been all but eliminated. In addition, the popular 720p widescreen 16:9 video mode is also supported. The NFC31-IR Network Camera provides better image quality while consuming less network bandwidth thanks to the integrated H.264 video compression. The NFC31-IR Network Camera also supports MPEG4 and Motion-JPEG video formats, providing superior quality and, at the same time, continuing to support existing applications. Finally, 3GPP mobile phone streaming is provided for easy on-the-road connectivity with your 3GPP-enabled mobile phone. The NFC31-IR Network Camera supports the 802.3af standard, allowing it to be installed in locations where an AC power source is not readily available. Simply plug the camera into a PoE-compliant switch and begin transmitting power as well as data over the Cat5e or Cat6 network cabling. The INTELLINET NETWORK SOLUTIONS NFC31 Megapixel Network Camera is designed for security surveillance applications, and comes fully equipped with state-of-the-art features that set it apart from other network cameras on the market today. 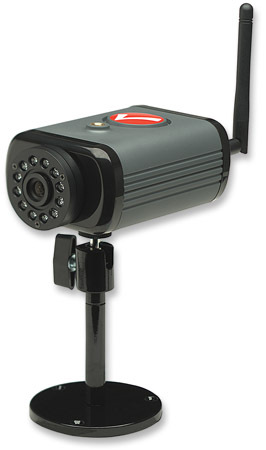 The NFC31 Network Camera is equipped with a 1.3 megapixel image sensor that generates crystal-clear images in resolutions of up to 1280 x 1024 pixels, providing a much more detailed video. Thanks to the use of progressive-scan technology, jagged lines caused by regular interlacing image sensors (flickering effect on moving objects) have been all but eliminated. In addition, the popular 720p wide-screen 16:9 video mode is also supported. The NFC31 Network Camera provides better image quality while consuming less network bandwidth thanks to the integrated H.264 video compression. The NFC31 Network Camera also supports MPEG4 and Motion-JPEG video formats, providing superior quality and, at the same time, continuing to support existing applications. Finally, 3GPP mobile phone streaming is provided for easy on-the-road connectivity with your 3GPP-enabled mobile phone. Utilize the free DYNDNS service (like DYNDNS.org) in order to connect to your camera, even if you do not have a static IP address assigned by your ISP (Internet service provider). This feature lets you easily set up a URL that can be used to access the camera through the Internet using any Web browser. The Intellinet NFD30 Network Dome Camera is designed for security surveillance applications, and comes fully equipped with state-of-the-art features that set it apart from other network cameras on the market today. 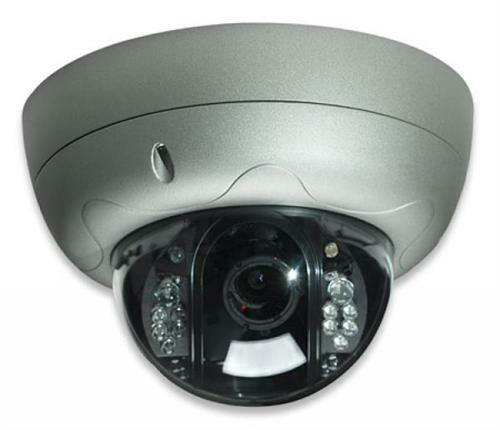 Because the NFD30 Network Dome Camera uses a progressive-scan CMOS sensor, it provides sharp video images with dramatic lifelike color representation. The NFD30 Network Dome Camera supports MPEG4 as well as Motion-JPEG video formats, providing superior quality and, at the same time, continuing to support existing applications. MPEG4, on the other hand, allows you to transmit a larger amount of data over the same amount of bandwidth while providing smooth and seamless viewing. Attaching a microphone and loudspeakers to the NFD30 Network Dome Camera will allow you to listen and talk using the two-way audio support. On top of that, the camera is equipped with an internal microphone. 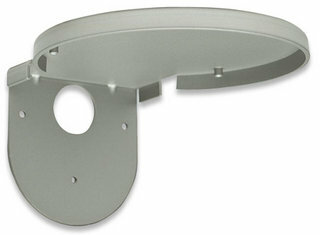 This is ideal for most security and surveillance applications. 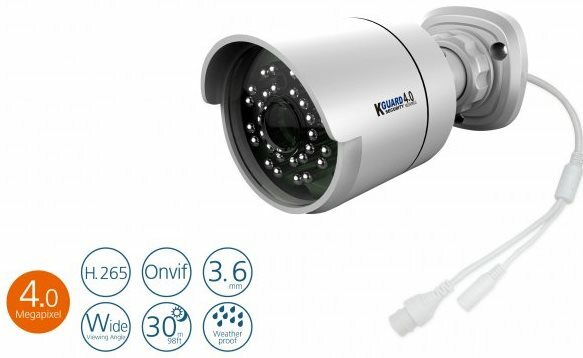 The KGuard IPB-400 is an indoor-outdoor 4.0 MP PoE IP Security Camera supports HD image display, by a 3.6mm Fixed lens with IR Cut Filter , allowing users to have clear and sharp monitoring pictures. Its infrared projection distance could reach up to 30 meters for dark area monitoring, It is suitable for places like shops, banks, stadiums, factories, warehouses. This camera also supports ONVIF 2.3 standard, which allows the camera to be used with other brand NVR’s and simplifies system integrations. • Max. Resolution: 4.0MegaPixel (2592x1520) @ 30fps. • Lens: 3.6mm fixed . • Video Compression: H.265/H.264/MJPEG . • Night Vision: 30 meters . 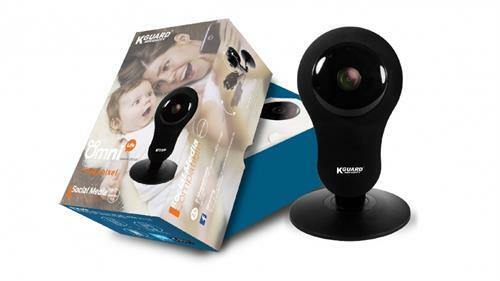 KGUARD's QRC-601 Wi-Fi network camera with 1080P high resolution is able to provide excellent quality videos and images. 1080P resolution is 50% higher than 720P resolution. 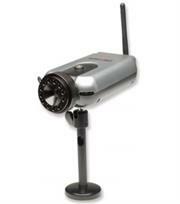 With the tilt function, QRC-601 could vertically adjust up to 160 degrees. 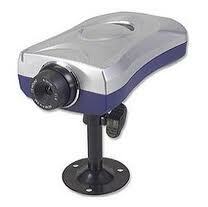 In addition, by using motion technology, users can focus on some important areas where you want to protect. 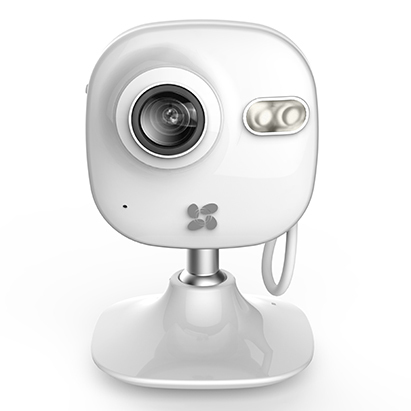 The camera will start to record the images and send an email to you once it detects moving objects. Furthermore, KGUARD provides free KViewLife app for iOS and Android system to allow for remote monitoring anywhere, and social media sharing. With latest EZ mode technology, users could setup Wifi connection in just a few steps via KViewLife. Once the setup is complete, you can check and share videos from your device right away. 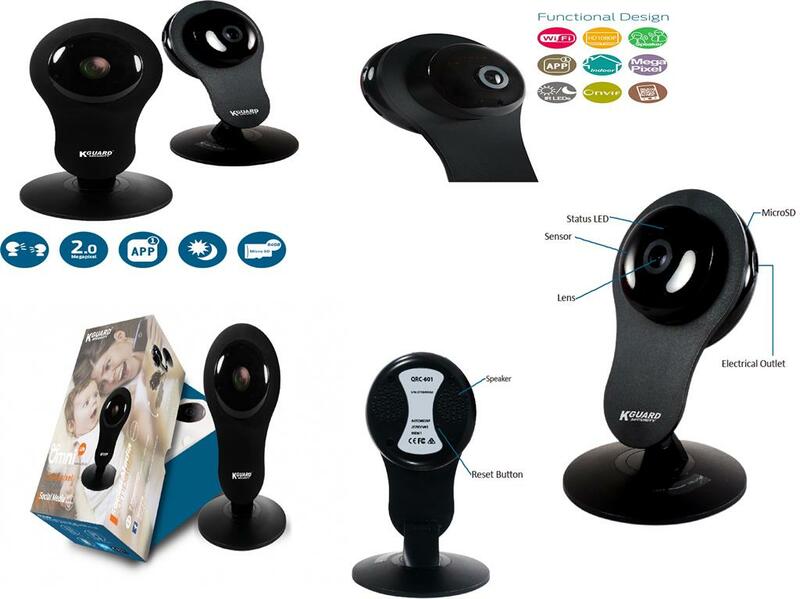 • Utilizing EZ Mode technology, allows you to set up your camera directly via smartphone/tablet. • No configurations required for live viewing on smartphone/tablet. 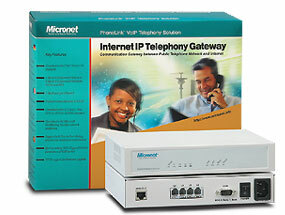 • Two-Way audio enables you to listen and talk remotely through smartphone/tablet. • Detection of intruders triggers push notifications to smartphone/tablet, e-mails and video recordings, offering a comprehensive coverage of your security needs. • Support MicroSD card up to 64GB. 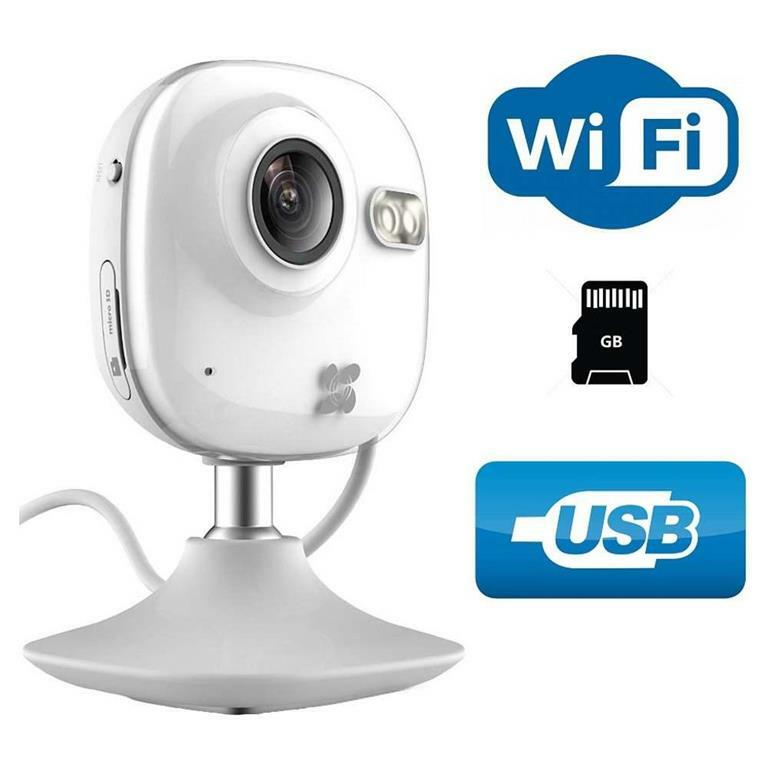 • Support live viewing and recording in 1080P (2 Megapixel) HD resolution. 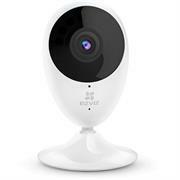 Ezviz C2C Indoor Internet Camera,2 megapixel resolution; 15fps, 2-way audio. 5m IR distance. Support one-key configuration for Wi-Fi; motion detection and alarm review. Light and handy device, easy for installation. Support video alarm service for mobile phone and Web. Upto 128G SDcard supported , Retail Box, 1 Year Warranty. 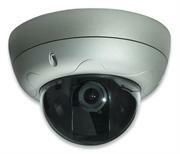 EZVIZ products have been designed for your entertainment, communication, security. When you install the EZVIZ APP on your smartphone or tablet, EZVIZ devices will be connected to the cloud via their QR code and will immediately be online. With EZVIZ you can talk to your loved ones, watch your childs progress when you are away, keep an eye on your home, interact with your four-legged friends, prevent household accidents. Ezviz C2 Indoor Internet Camera,1 megapixel resolution.15fps, Built-in microphone. 10 meter IR distance. Supports one-key configuration for Wi-Fi and motion detection. 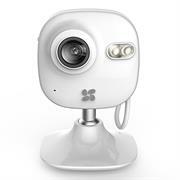 Light and handy form factor, easy installation.Supports video alarm service for mobile phone and Web. Upto 128G SD card supported , Retail Box, 1 Year Warranty. 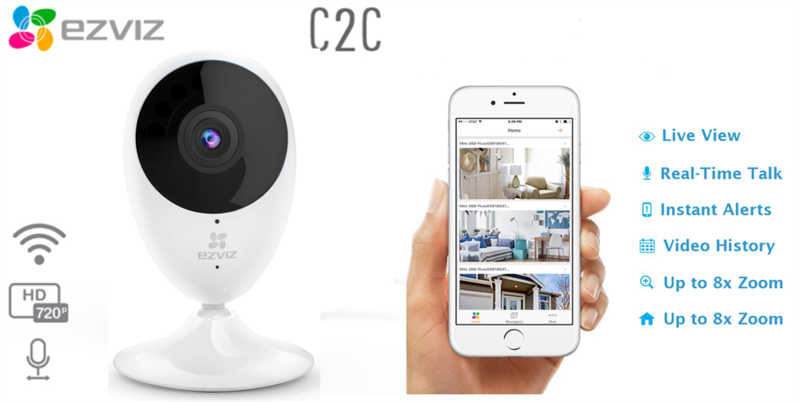 EZVIZ C2mini is security camera. To get it working you only need Wi-Fi connection, EZVIZ application and power source. Download free EZVIZ application to configure camera, view live video or view motion recorded clips. Advantage of EZVIZ system is that you don’t have to do anything besides configuring camera with app to watch live or recorded footage over mobile 3G or 4G connection. Camera has built-in microphone and infrared lights that enable you to see in complete darkness up to 10 meters.